During a recent stream, professional Overwatch streamer aimbotcalvin pointed out four different accounts in the game’s top 20 competitive ranking list that he said belonged to him. Viewers got angry and said he was hogging slots that other deserving players could occupy. “Earn it,” he replied, laughing. Aimbotcalvin isn’t the only Overwatch player with multiple alternate, or “smurf,” accounts. To hear some players tell it, Overwatch’s top 500 is more like a top 200 or 300. In the past few months, it’s become a commonly-held belief on places like the Competitive Overwatch subreddit and official Overwatch forums that many top 500 players have smurf accounts they’ve leveled up the ladder in addition to their mains. In theory, the top 500 is meant to be reserved for the 500 best individual players in any given region. You earn a special icon for it, as well as more competitive points (which go toward cosmetic items) than lower-ranked players, but near the top, it’s mostly about prestige. During a stream two days ago, aimbotcalvin, who streams for major league esports organization TeamSoloMid, flippantly admitted to having multiple smurf accounts in the top 500, pointing out specific accounts that he claimed were his. Because aimbotcalvin is such a well-known figure, some saw his admission as confirmation of something they’d suspected for a long time. Aimbotcalvin’s confession has sparked conversation from casual players and pros alike, with some contending that players like aimbotcalvin are squashing the hard-earned fruits of other players’ labor. On the Overwatch forums, a player named Gaze said that aimbotcalvin has definitely earned his spots, but that doesn’t mean what he’s doing is right. “There are people who also deserve that prestige, but don’t have it, because Calvin and others who choose to have multiple accounts are using their skill to hold multiple spots,” they wrote. Pro player Emongg agrees with this line of criticism. During a stream yesterday, he mentioned the discussion following aimbotcalvin’s admission and said he plans to neglect his smurf accounts so that they’ll fall out of the top 500 on their own, thanks to competitive mode’s rank decay system. Top ranked Mei player Jardio, meanwhile, took aim at the notion that advancing through the top 500 takes a lot of time. “Do people not realize the gap between Top 500 and Top 300 is like... 3-4 wins?” he said on Twitter. 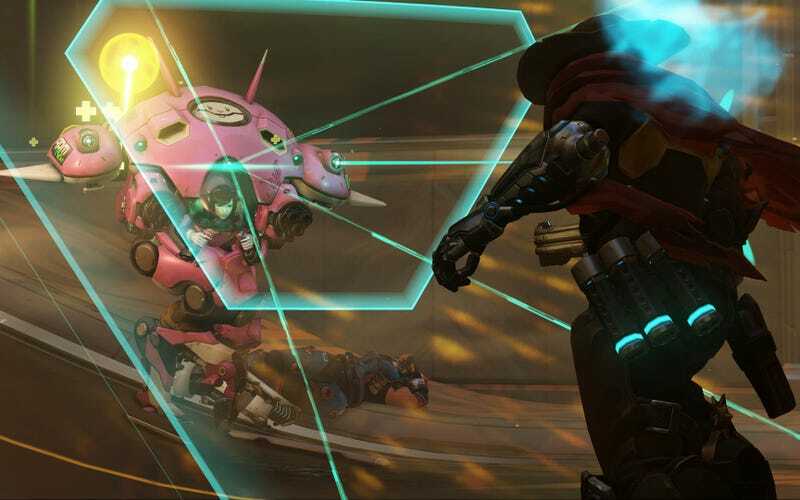 Overwatch forum user SilverSkyway contended that it could be worse: Players like aimbotcalvin could be running around at lower ranks, stomping new players like ants. Instead, aimbotcalvin is at least tussling with players his own size. “He tries at every account he plays,” SilverSkyway wrote. Top 500 smurfers aren’t breaking the rules, exactly—Blizzard allows multiple accounts as long as you purchased a new copy of the game and aren’t, say, sharing the account with another player. But they are taking advantage of Overwatch’s ranking system in a way Blizzard probably never intended and, at least on paper, swiping a handful of other players’ chances at gold and glory. As a solution, some players have suggested some kind of account verification system involving ID or a phone number so that it would be more difficult for players to have multiple accounts in the top 500. Something like that, however, could inconvenience regular players, which would probably make it unappealing from Blizzard’s perspective. It’s impossible to know exactly how pervasive this issue is. Unless every player with a smurf account in the top 500 admits to it, the best anybody can do is speculate. Still, just from a numbers standpoint, it seems fundamentally off that one player can occupy one-fifth of a game’s top 20. Short of changing the rules, it’s not clear what Blizzard could do about it. Perhaps the discussion will inspire the Overwatch team to finally take action.